Irrespective of whether the Popess is regarded as a real figure of history or as a legend, some information can be found in the chroniclers and in source texts. These make it possible to reconstruct the biography in broad outlines. Those who believe that Joan is a legend should only use the information provided by Martinus Polonius. In order to complete the picture, sources are also used here which assume the real existence of a Popess and regard the description of the unnamed pope in the Liber Pontificalis as part of the biography of Joan. After the source texts (Polonius and others) Joan was born in Mainz. A year of birth is not known. Based on her career and pregnancy (probably before the age of 40) it can be calculated that she was born in a time window between 825 and 830. Because of her nickname Anglicus it was assumed that her parents were missionaries from England, who had followed the call of Bonifatius in the course of the Christianization of Germany. According to Liber Pontificalis, her father introduced her to the seven liberal arts. These seven subjects from antiquity were also considered in the early Middle Ages as preparation for studies in theology, jurisprudence and medicine. They consisted of the trivium (grammar, rhetoric and dialectic) and the quadrivium (arithmetic, geometry, music, astronomy). If we stick to the sources, it must be assumed that Joan attracted attention early on because of her great talent. To deepen her knowledge and expand her scholarship was only possible with monks. The young woman therefore masqueraded as a man and entered a man's monastery, presumably in Fulda (Germany). A disguise was relatively simple with the clothes rites in the Franconian empire, clothing and hairstyle differed only slightly between men and women: The tunic was shortened and further on the leg was gathered up, the hair was cut and dressed in a kind of pageboy cut or "Beatles mushroom head" and already the male appearance was there. It stated that priests and monks of the Latin Church (unlike the Greek Church) had to be fully shaved. With the tonsure usual at that time and in a monk's robe she could probably dive quite simply into the monastery. Martinus Polonius also reports that Joan went to Athens with her companion and continued her studies there. Why Athens and not Constantinople? The Byzantine Emperor Leo V had initiated the second phase of the dispute on icons in 815. Previously, Empress Irene (who mentioned Anastasius in his letter to the Popess) had again permitted the worship of icons, so she was liberal about this question. Irene came from Athens. It can be assumed that a more liberal spirit prevailed in Athens in general, ideal for studying. After her studies in Athens Joan came to Rome. There she taught the trivium in the Santa Maria in Schola Graeca (today Santa Maria in Cosmedin). dThe trivium was the three linguistic subjects of the Seven Liberal Arts. 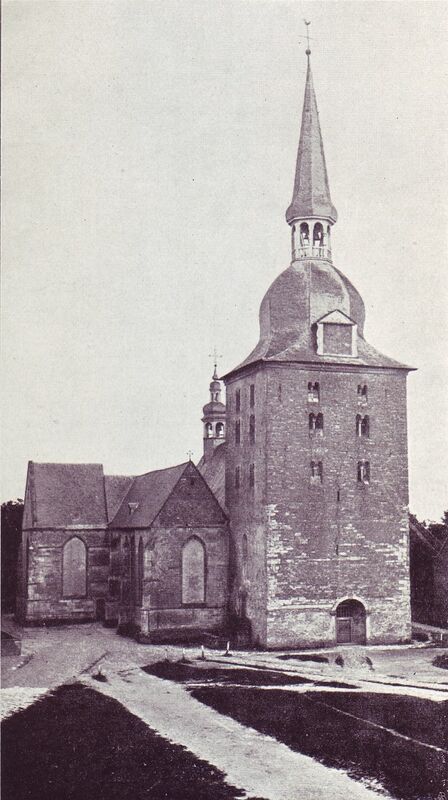 This church still stands today in the building fabric of the 9th century. 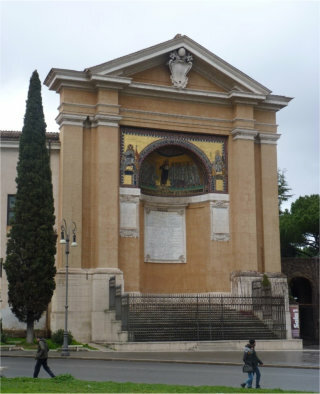 Today it is called Santa Maria in Cosmedin and is known to many because of the so-called Boca della Verità. Still today it is a Greek-Catholic church for a cardinal deacon. The Liber Pontificalis reports that the unnamed Pope had been appointed Sub Deacon under Sergius II. Pope Leo IV raised him to the position of Cardinal Deacon. These career steps correspond to the descriptions of those chroniclers who report about Joan. Leo IV died c. 853 and Benedict III was elected as successor. According to the documents, Cardinal Deacon John played an important role in the papal administration. His outstanding abilities were recognized and appreciated by the clergy, nobility and people of Rome. Furthermore, the Liber Pontificalis reports that Pope Benedict III could not be without his favourite John and preferred him to his own family. The Latin text implies a close emotional relationship. One can speculate whether Benedict III knew that his confidant was a woman, Joan alias Johannes Anglicus. After the death of Pope Benedict III, the Cardinal Deacon John - or Joan - led the celebrations for his burial. Presumably surprisingly she was elected by the people as his successor in the papal office. Joan does not seem to have aspired to this office. 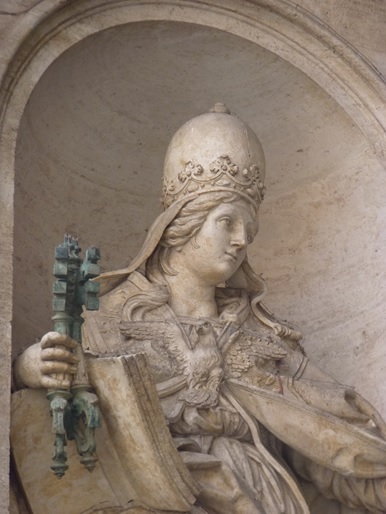 She hid in the Lateran Palace and was literally elevated to the papal throne by the masses. The new pope chose the name John VIII. Only later chroniclers accuse Joan of having lifted herself to the papal throne with black arts. The earlier sources emphasize the opposite: she had not aspired to the office. - The Pope's election was a kind of mishap in the career she aspired to as an intellectual. Important guests from northern Europe were present at the coronation of Joan as Pope Johannes Anglicus: The new Carolingian Emperor Louis II of Italy and Æthelwulf of Wessex, an English local king. Newly elected popes needed the approval of the Franconian emperor (the right of intervention in use at that time). Ludwig II seems to have given her consent to the papal office; he himself was emperor because his father had abdicated, but he was not yet sacredly crowned by the pope. In other words: John Anglicus (Joan) and Louis II were politically dependent on each other. 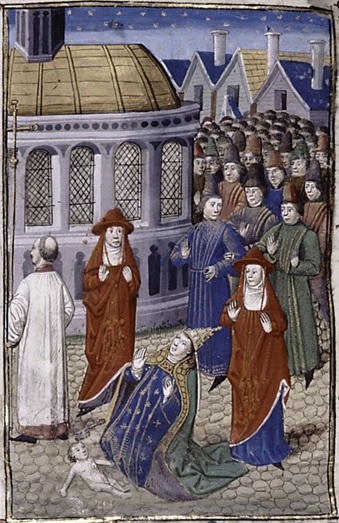 The Liber Pontificalis also describes a banquet episode which contains indications that Louis II must have known or at least suspected that the new Pope was a woman. The banquet took place in the field camp of Louis, an unusual place to meet. The sacred coronation of Ludwig II was probably carried out by Popess Joan in 856. In the same year she also received Aethelwulf of Wessex, who made generous donations to the Holy See. This is reported by chronicles (Magdeburg Centuries). Aethelwulf must have left Rome by the summer of 856 at the latest, because he moved to Western France and married Judith, the daughter of King Charles II the Bald, there on 1 October 856. Exactly datable events are missing for the following years. Some theologians (Spanheim, Morris) suspect that the Pope could draw for the important liturgical reform. At the request of Emperor Charlemagne, the Gallican rite in the north of the Frankish Empire was to be reformed and adapted to the Roman rite. ll popes from this time belonged to the city Roman clergy, so they only knew the local Roman rite. Around the middle of the 9th century the mixed rite desired by Charlemagne was finally created. He combined elements of the Gallic and Roman rites in a theologically thought-out and elegant way. Friedrich Spanheim as well as Joan Morris suspect with good arguments that Popess Joan could be responsible for this reform. She was the only Pope who came from the north and therefore knew the northern Gallican rite. Moreover, her pontificate fell into a phase of relative political calm. Leo IV had to fend off the Saracens and had the leonine wall built for this purpose. Few details are known about Benedict III. Spanheim considered him not to be an intellectual man. The successor of John Anglicus alias Popess Joan was Pope Nicholas I. Nicholas I fought fiercely with Louis II about who had the supremacy, the Pope or the Emperor. The dispute culminated in the emperor besieging Rome in 864. He also went on confrontation in ecclesiastical matters: with the Orthodox he fought over the missionary work of the Slavs. His theological works were later condemned as heresy. Thus, Popess Joan is most likely to be responsible for the important liturgical reform. This new liturgy existed throughout the Middle Ages and was only slightly adapted during the Counter-Reformation. In essence, the adapted rite of the liturgy remained until the Second Vatican Council (1962-65), as postulated in specialist literature. The death of the Popess after a two-and-a-half-year pontificate is only documented by the chroniclers of the High Middle Ages and later. According to this, she is said to have fallen during a procession from St. Peter to Lateran and to have died in the street. It is believed that the Popess died during the Easter procession. The date of Easter depends on the lunar calendar, according to which the Pope could have died at the beginning of March 858. This would correlate with the 1-month Sede Vacante and the election of Nicholas I on 24th April 858. The procession from St. Peter to the Lateran is still in use. Strikingly, since the Middle Ages a section of it has been avoided and a strange detour taken instead. The successor of John Anglicus / John VIII alias Popess Johanna was Nicholas I. According to official church history, he was elected Pope on 24 April. This would correspond to the month of papal transition, about which Martin von Troppau reports. Near the place where Popess Joan is said to have died there is a small Marian shrine. (Via dei Querceti, 27, 00184 Roma RM Italy Geo tag: VFQX+G5 Rom, Italien). 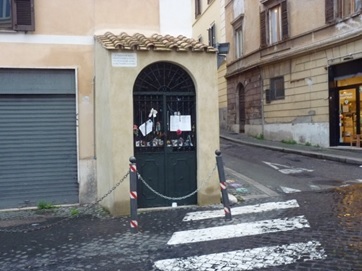 It is generally known under the name «Shrine of the Popess». There is said to have been a statue of the Popess with the child in her arms. Even Martin Luther had seen it on his visit to Rome as an Augustinian monk. In the course of the Counter-Reformation it was removed and is said to have been thrown into the Tiber. What else do we know about Pope Joan from the source texts? Relatively much compared to other popes of that epoch. 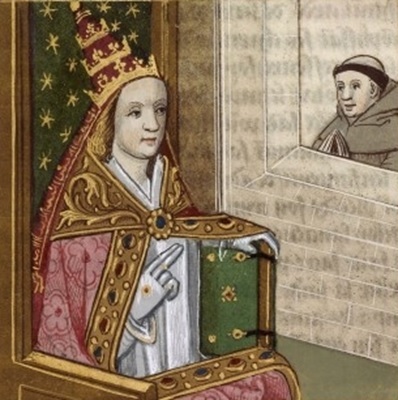 According to Liber Pontificalis the unnamed Pope - Joan - is described as beautiful in appearance and decent in behaviour. Emperor Ludwig II was enthusiastic about her outstanding communicative abilities. The Liber Pontificalis also describes the nameless man as a pious and modest mystic who generously cared for the poor, widows and orphans. Other chroniclers also attest these abilities to the unnamed man - or the Popess. 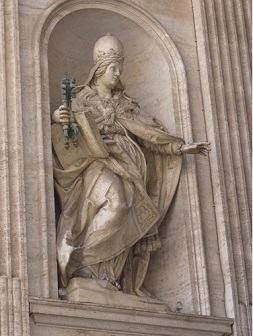 The pontificate of Pope Joan was exemplary, even by today's standards. But she was a woman.